Among the Canadian soldiers who fought in Western Europe a very special group should be noted; even though they have been lost in the annals of history. On this the following; due to various reasons in 1942/1943 the British army had a serious shortage of young officers (captains and lieutenants) for its infantry regiments. In Canada on the contrary, thanks to great interest for doing service in the army, a surplus of men in this category existed. The Canadian and British authorities late 1943 decided to a, by the parliaments of both countries, approved agreement on the basis of which the well-educated Canadian captains and lieutenants, on terms of voluntary, could temporarily be posted with units of the British army. In other words, they were loaned to England. From then on they became known as “Canloans”, which means “borrowed from Canada”. From 6th June 1944 (D Day) until the end of the Second World War no less than 673 of these young officers fought in many regiments of the British army in Western Europe. 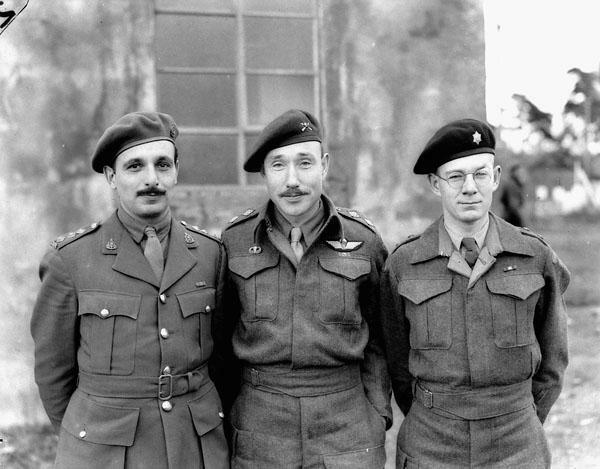 Furthermore during the deployment of the 1st British Airborne Division at Arnhem (operation Market Garden) on 17th September 1944 these Canadian officers were sent in to action. By their performance the Canloans acquired much appreciation everywhere. This is reflected by the fact that 107 of them were presented awards for courage. No less than 128 Canloans were killed in action which equates to nearly 20% of their total. Of them 41 are buried in the Netherlands, both at military as well as civilian cemeteries. The Board of RCL Branch 005 has the shared view that the Canloans deserve much more attention, in any manner whatsoever then they have been receiving and not merely at commemorations.